When working in extreme temperatures it is important to monitor your body temperature. In freezing weather, your fingers and toes get numb and you can develop frostbite without even noticing it. Likewise, if your core body temperature drops too low, you can start to start to suffer the effects of hypothermia before you are aware of it. So I designed an automatic temperature sensor that will monitor the temperature of your fingers, your toes, and your torso, as well as the outside temperature. This can help you to stay safe when working in extreme cold. There are a lot of different kinds of temperature sensors that you could use for a project like this. There are thermocouples, thermistors (temperature dependent resistors), and temperature dependent transistors. 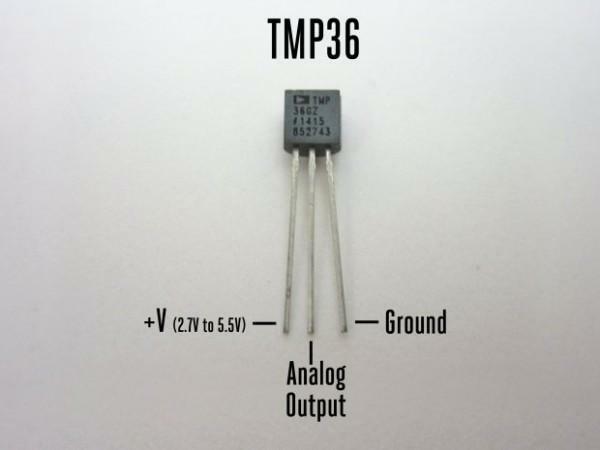 I am using a TMP36 integrated circuit. I chose this sensor because it has a linear output and does not require any calibration. Temperature (in Celsius) = [Vout(in mV) – 500] / 10. It also has a very wide operating range (−40°C to +125°C). It works by using several transistors with different sized emitter layers. These transistors will have different outputs at different temperatures. By comparing them, you can determine the temperature. The output given at the center pin starts at 750 mV (at 25°C) and changes by 10mV per degree Celsius as the temperature changes. If you would like to see a tutorial on how to use this sensor you can check out this Instructable by Adafruit Industries.